Dine at Raising Cane’s on Tuesday, March 14th all day in Aliso Viejo, Costa Mesa, Downey, Laguna Hills and Orange, mention The Pet Adoption Center of Orange County and 15% of your bill will be donated to the PAC. South County Pet Expo & Dog-a-Palooza! Mark your calendar for Sunday, November 13th. We will be joining other local groups at Furly’s in Lake Forest. 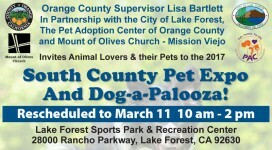 Come meet our available dogs, and hear about the adoption center we are opening in Lake Forest. We rely on the generosity of animal lovers to provide for the adoptable pets in our care. Please consider making a contribution to help us continue to rescue these dogs. 501(c)(3). EIN: 47-3705568. The Pet Adoption Center of Orange County is a nonprofit, 501(c)(3) organization that connects adoptable pets with loving people and the resources they need to be a family for life. EIN: 47-3705568.